Because indie game makers need something to do while pursuing their dreams of becoming monorail conductors, developer GumpyFunction created playable versions of three video games featured in classic Simpsons episodes. 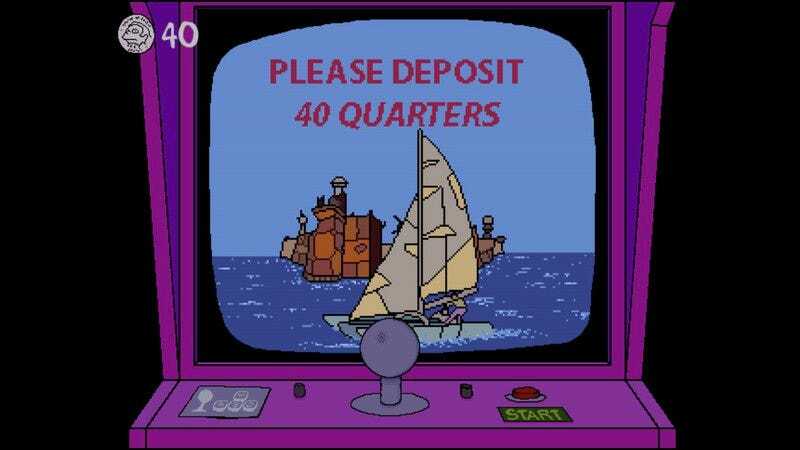 Kevin Costner’s Waterworld (from “The Springfield Files”), is basically a playable version of the episode’s gag, while the Battletoads-inspired Escape From Grandma’s House (from “Bart Gets An F”) has more gameplay, but also diverges the most from the version you see in the show, in that there’s no opportunity to blow grandma away with a shotgun, for instance. Larry The Looter (from “Radio Bart”) is the most like a classic 8-bit era beat ’em up, and in a nod to older gamers, lifts music cues from the original Contra and what sounds like Ninja Gaiden 2. The only personal disappointment is that Touch Of Death wasn’t one of the three games included here. But as one Reddit commenter notes, there are more than 70 fake video games in the show’s ongoing two-decade run, so there’s plenty more that could be done.